The twists and turns of copyright law are arcane at the best of times, especially when digital images are involved, but it’s not often that the debate over ownership rights turns to whether a crested black Macaque monkey from Indonesia can own the copyright to a photo she took of herself. But that’s exactly what was triggered by a recent article in The Telegraph, in which the camera’s owner — wildlife photographer David Slater — claims that his request to have it removed from the open-source Wikimedia Commons library was denied because Wikimedia’s editors believe that the monkey holds the copyright to the photo. That’s not strictly true, however. In fact, the editors at Wikimedia (which manages the library of more than 22 million images and videos associated with the open-source encyclopedia) rejected the photographer’s demands because they believe that no one holds the copyright. A monkey can’t hold the rights to an image — or anything else, for that matter — because they aren’t human, and therefore don’t have the legal standing required to do so. But even if the monkey doesn’t own the rights to the photo, shouldn’t the photographer own the rights, since it was his camera the monkey used to take the picture, and he did the editing and publishing of the photo? That may seem obvious, but nothing about copyright law is obvious, and legally speaking Wikimedia has a strong case that no one actually owns the rights to the picture. We’ve actually been down this road relatively recently, although it didn’t involve a monkey: after a “selfie” of a group of famous actors went viral on Oscar night, breaking the record for the most retweets on Twitter with 3 million or so, a debate began over who owned the rights to this suddenly iconic image. Was it Ellen DeGeneres, whose camera was used? 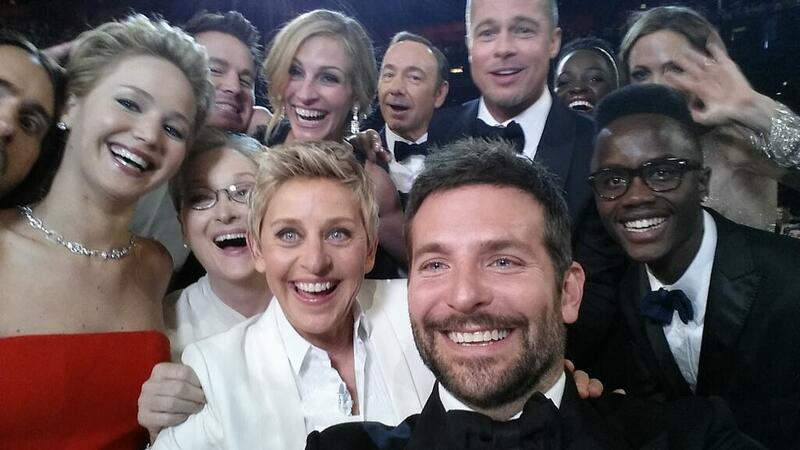 Or was it Bradley Cooper, the actor who actually snapped the photo? According to copyright law, the person who creates the picture is the copyright owner (unless he or she is acting as an official “agent” for the photographer, under a so-called “work for hire” arrangement). As an entertainment lawyer explained following the DeGeneres photo, when copyright law as it applies to photography was formulated, cameras were relatively complicated and the courts likely didn’t imagine a day when everyone would have a camera in their pockets, so they gave the rights to whoever pushed the button. Under U.S. law, if a “natural person” is not the author of the work, then it is considered anonymous. According to comments that Slater made to The Telegraph, the photographer may be considering a legal challenge of the Wikimedia Commons decision, so we may get more official confirmation of this point eventually (and there is still some debate about the DeGeneres photo, even among copyright experts). But until then, the editors at Wikimedia appear to be on fairly firm ground. Just like in the IR-trigger case, the photographer made this shot possible. He initiated the shoot in the forrest, he used his resources and skills to get the pictures he wanted. It was his camera, with all the technical presets in place, that the monkey used. So, in my opinion, the photographer created the circumstances which lead to this shot. The fact that the monkey pressed the button doesn’t make her owner of the copyright. Right, and what about pics taken with the self timer? All public domain because none pressed the button? And how about time capture pic series, all public domain too? Or those when owners throw their GoPro up to the air? How about satellite images then? Or those taken by space probes? It’s the “button pressing” idea that doesn’t have a leg to stand on, but: 1. It will take the poor guy more money than what he paid for the trip to litigate it and 2. Wikimedia needlessly became the bad guy through using a ridiculous technicality to help themselves to a free pic. it’s a picture People Wake up jeesh. Why does it matter? What about the popular film-festival phenom, movies made from footage captured on a catcam attached to the cat’s collar. Is the cat the filmmaker? Can she be considered a person, or would the Supreme Court say she is less human-like than a corporation? For that matter, why not incorporate the monkey? Then he’d be considered a person under US law, eligible to hold a copyright. I thought Rupert Murdoch arranged to own the rights to all photos. Or was it Mark Zuckerberg? “Compose” is an interesting term to use. I would argue that, in photography, post processing is just as important, if not more important, than the initial image capture. I guarantee you that the monkey “selfie” as now presented looks far different than the original raw image. Orientation, saturation, contrast, brightness, warmth, cropping – these are all artistic decisions that are often made after a shoot with Photoshop. Also, there is more to photography than camera orientation and shutter activation. Did the monkey select the lens, set shutter speed, or calibrate white balance? Did it even select a focus preset? I would argue that this monkey’s activity has more in common with pressing the “Start” button on the microwave after someone has already put a popcorn packet into it and punched the correct time into the timer. To further abuse the analogy, the melted butter wasn’t added by the monkey either. I agree with this one. If the original, possibly RAW file was uploaded, then yep, that’s the monkeys picture. The photo we look at now, nope that’s the authors (Mr Slaters) work – starting with a possibly non-copyright original image it has become a new image created by and copyright of Mr Slater. Unless Mr Slater were to release the original, the only image out there is his work. I could pick a dozen public domain photos (note I’m starting with non-copyright ones), combine and make them into a piece of art – that art is my work and I own it. 1) You are sitting on a park bench and sit your camera down and walk away. Someone picks it up while you’re gone, and takes a photo of a Cat, tap dancing, and puts the camera down. Do YOU then, have the right to go home and upload that photo to say, stock sites, and sell that photo as if it’s “yours” and you took it? Hmmmmmm. 2) You lease a camera from a leasing company and take some photos – if we’re going under the assumption that “whoever owns the camera that’s used owns the copyright to photos taken with it”, then, wouldn’t the company you leased the camera from have the right to claim copyright ownership of every photo you take with their equipment? Again… Hmmmmmm.. I think some of the technicalities of the story is silly like most do, but I think I have to agree that he did not actually compose and take the photo – so since an animal can’t have copyright, the photo is simply not owned by anyone and is a fluke and up for use. And I do say this as a stock photographer who understands what it’s like to have an image or two swiped. Half of the patentable inventions were unintentional and accidents. As others have said, taking a picture is only a single aspect of est. a copyright, the equipment was bought, prepared, and used. The processing of the images afterwards. Etc. In fact, how many photographers actually even own the images they take with their equipment. This is simply a bad ruling. No surprise really in our modern court system. And of course you are now a copyright infringer too because you know that I claim copyright, yet you credit the photo to Wikimedia (not me nor the monkey nor even public domain, but to a corporation that deal in illusion and mind control. You support their stance in encouraging others to steal the image and that is unlawful. This is not fair use either – because it is not fair and yu have used the images in their entirety. This use of my images illegally is willful and in no way an ignorant act. I have a screen grab of this that will be used in evidence in due course. Probably the bigger thing for me is that Wikimedia is being obtuse at this point. The (human) photographer very reasonably assumed he was the copyright holder. Wikimedia just looks bad getting into hair-splitting legalities about the sorts of creative input needed to own the copyright to a photo. While a fascinating debate, is this really the sort of thing Wikimedia wants to get involved with lawyers about? Thanks for the comment, and I agree with your logic — but it’s a little more complicated than that. The law doesn’t say the monkey can’t be the image’s creator, i.e. the one who causes a work to be made, it just says that he can’t hold any copyright. In other words, it’s anonymous. As far as I can tell, it doesn’t just revert to the photographer because he processed the image, although I could be wrong. Mathew, even if one assumes that Monkeys can create (with the specific intention of creating, and not by accident) selfies, the question that pops up is who owns the copyrights? If it were the monkey, then what/who gives Wikimedia the rights to use the images? One reasonable possibility is that the owner of the monkey and the photographer whose equipment was used are “joint” owners of the copyright. The photographer qualifies as a part owner in this case, not merely because his equipment was used, but possibly because he intended or accepted that his equipment be used by the said monkey, hence consented to the creation of content using his equipment. The owner of the monkey, if it lives in the wild, would be the government of the country. That said, I’d rather request the photographer for free usage of the images – given that wikimedia is an open source, not-for-profit, platform providing free information to the entire world. Of course suitable credits should be provided, but a legal battle over monkey selfies does the world no good. What about naturalistic photo trap? It uses IR trigger for the shot, so photographer isn’t the copyright owner? National Geographic photographers could be scary if we assume right that. Seems to me the same logic can be applied to the monkey selfie, photographer used and set up all the equipment for take the shot, so he is the copyright holder. but the photographer sets up the IR trigger. The Elen selfie question is a bit of a straw man. Bradley Cooper, unlike the monkey, is capable of creating a work as well as holding the copyright. That work was created at th point he took the shot. Besides that Selfie gets way more involved than who’s camera was used and who took the shot. There’s the question of the participants either being agents of AMPAS or having assigned rights to AMPAS. Dolby Theatre’s operators, CIM Group, could even have a claim depending on easements. But that’s all by the by. As far as I can figure US copyright law the work was created by the photographer because the monkey is incapable of creating a work. Effort was expended by the photographer in the production of the work both before and after the monkey’s involvement. The alternative, if Wikimedia’s assertion is upheld, would mean every image captured through a chance occurrence wouldn’t enjoy any copyright protection. A chance occurrence could even be someone sitting on a camera remote accidentally. Did their but take the photo or was it a mistake? Argumentum ad absurdum there. Sorry. But it really isn’t as tricky an issue as it’s framed to be. Wikimedia are just being smartasses because the alternative is they’ve infringed someone’s copyright. It’s more relevant if Wikimedia’s actions have led to a loss for the photographer. On that question it’s a lot more murky. Would the image have as much value if it hadn’t been widely distributed in breach of copyright… etc.? Fun bit of thinking on a humpday though. Thanks. Or to continue on the accidental theme. What if I’ve set a camera to take random photos in various ways? OK maybe I’ve made the artistic decision to do so. But how would that be any different from if he had given a monkey a camera to take selfies or attached a GoPro to something? Doesn’t really seem complicated.